"many a good mile with you. always a great time with a great..."
"RIP Mike was fun working with you. You have come full..."
"May the God of comfort be with you at this time"
Guy Michael Close, age 53 passed away on December 14, 2017. He was born on December 17, 1963 in Vancouver, WA the son of William Close and Susan (Marshall) Close. 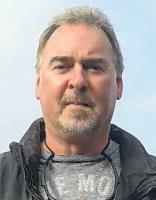 Mike graduated from Hudson's Bay High School in 1982 and went on to continue playing basketball at Clark College. He loved basketball, fishing, crabbing, clamming, oysters, being at the beach, outdoors and most of all, his family and friends. He retired from BNSF railroad after 23 years of service. Mike was friendly, outgoing and loved to meet new people. He was known for his positive outlook on life and quirky sense of humor. He was soft spoken, kind and compassionate. Mike encouraged people to be happy, let go of differences and enjoy life. He was preceded in death by his father Bill Close. He is survived by his mother Susan Close; three children, Caitlin, Zachary and Noah Close; grandchild Declan Close; brother Bill (Christine) Close; sister De De Close; best friend and life companion Robin Balch, as well as many friends and family who love him dearly. A celebration of life will take place at 3:00 p.m. on January 20, 2018 at Clover Valley Community Church, 3212 Lewis River Rd., Woodland, Washington.